No city celebrates the holiday season quite like New Orleans. By the time Thanksgiving rolls around, it’s all systems go in the Crescent City, which pulls out all the stops with lights, sparkle, and of course, holiday pageantry. New Orleans’ rich history, informed by the diverse heritages of its people, means that Christmastime in NOLA is uniquely New Orleanian–an experience unlike any other. From lighting Christmas Eve bonfires along the Mississippi to Creole-inspired Réveillon dinners, here are four holiday traditions that have a distinct New Orleans flair. The most wonderful time of year is even more special in New Orleans. 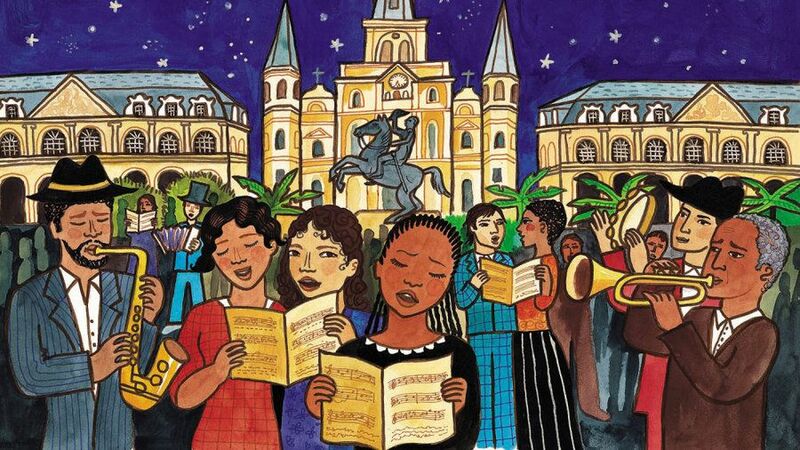 In the 19th century, New Orleans was predominantly Catholic, its roots extending back to France, Spain, and the Caribbean. Creole families (those descended from colonial settlers) would fast and celebrate Christmas Eve before attending Midnight Mass with one another. Hungry mass-goers would then end the Mass with a delicious feast. Nowadays, this post-Mass feast –Réveillon– is celebrated every day during the holiday season. It’s hard to picture a city that takes its food and culinary tradition more seriously than New Orleans, where old Creole dining customs and iconic street fare contribute to the distinctive regional cuisine.The way New Orleans celebrates Christmas, or Creole Réveillon, has evolved throughout the last three centuries; the reincarnation of this Creole holiday custom has been updated for modern tastes and lifestyles. Though Réveillon originated as a family tradition, anyone can partake freely in the extravaganza of good food and festive spirits at dozens of local restaurants. A Louisiana Christmas tradition: Bonfires on the Levee. When night falls on Christmas Eve, the fires create a lovely, vibrant glow all along the Mississippi River, lighting the way for Papa Noel and his team of reindeer. The tradition of lighting bonfires on the bayou dates back to the earliest Cajun settlers of southern Louisiana, who lived to the west and north of New Orleans. The idea is to light the way for “Papa Noel,” also known as Cajun Santa Claus, as he makes his airborne journey on Christmas Eve. Typically, about 100 (give or take) bonfires are lit along the banks of the Mississippi River, most of them 30 to 40 miles upriver from New Orleans in St. James Parish. It’s a spectacular sight. Celebration in the Oaks–a sublime light show in City Park, ranks among the country’s best holiday lights festivals. For this spectacle, City Park’s famous oak trees are adorned in twinkling lights and awe-inspiring light displays are spread throughout the 25-acre park. Many expect this year’s Celebration to be especially impressive, seeing that the 2016 holiday season marks the 30th anniversary of this wonderful tradition.